The founders of Room to Read believe that a « world change starts with educated children » ; they have thus committed to focusing on two key areas where they can have the greatest impact: literacy and gender equality in education. Literacy is indeed the cornerstone of all learning and fundamental for participation in today’s global society, yet 773.5 million people across the globe lack the ability to read and write. That includes every medicine bottle, employment ad and ballot form they encounter. Of all the illiterate people in the world today, two-thirds are female and over 90% live in developing countries. Educating girls and women is widely acknowledged as the most powerful and effective way to address global poverty. Women who finish secondary school earn more money, have smaller, healthier families, and are more likely to educate their own children—breaking the cycle of illiteracy in one generation. Room to Read partners with communities across the developing world to promote literacy and gender equality in education by establishing libraries, constructing classrooms, publishing local-language children’s books, training educators and supporting girls’ education. Operations in their program countries are run entirely by local staff who are familiar with the local challenges, customs and languages. 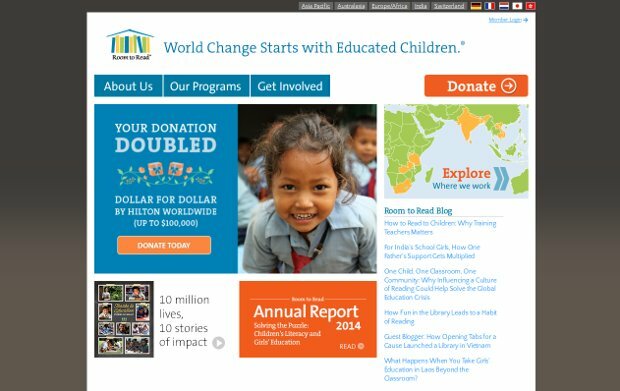 Over 9 million children have benefitted from Room to Read’s programs over the past 15 years – and over 9.7 million books were checked out from Room to Read libraries in 2012 only.